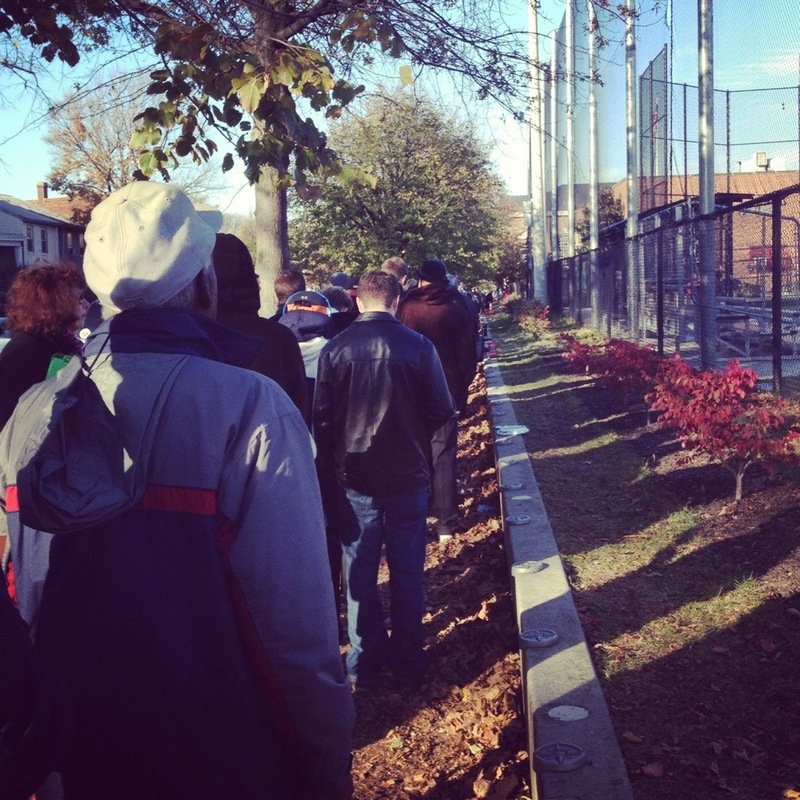 The long line at Watkins School, my polling place, on Tuesday. As I mentioned last night, I wanted to take a quick break from my (mostly) no politics rule and say how happy I am with the outcome of the election on Tuesday. Anyone who knows me outside the Internet knows that my views skew liberal, so the fact that President Obama defeated Mitt Romney pleased me immensely. I was also pretty excited to see that Virginia joined DC and Maryland in the Obama column, and that two of Maryland’s ballot initiatives – gay marriage and the Dream Act – both passed. The increasing blue-ness of my region makes me happy. When you read arguments about the ballot’s gay marriage question, replace “gays” with my name. Andrew shouldn’t be allowed to marry. Andrew getting married is a threat to families. Andrew cannot be a good parent. Andrew doesn’t love, it’s only lust. Andrew is what is wrong with this country. If Andrew can marry, then we should just let people marry animals. Being Andrew is a choice. The “gay movement” is about people who are in love and want to spend their lives together. It’s about legal recognition and protection of my commitment to another person. Now, I don’t know Andrew, but I do know Dana. And Jason. And Martin. And Shawn. And Lisa. And Chris. And many other names I could fill in there instead – names of people I can’t see being denied the rights I have. Anyway. That’s as close as I am gonna get to preaching for the cause here. Let me know if you want to come to town for the inauguration. It was a ton of fun in 2009, and my pull-out bed is available on a first-come, first-served basis. I believe in the two party system, certainly as an ideal/effort to keep the politicians checking on each other. Both parties have worthwhile points. Each party has had control and managed to make a mess and mockery of our country. Each party has also done some fine things while in “power”. Can this PLEASE be the time when the politicians work together for the common good? Compromise. Compromise. Compromise. I understand that Republicans are not happy with Obama. Let it go. Get on with the business of government by and for the people. Then if things are really as Romney predicted, the Republicans will get their turn in four years!